Savvy players in the global yacht charter market are looking to tap into the opportunities that developing economies in Asia Pacific, Latin America, and the Middle East and Africa present. The fast expanding economies in these regions coupled with popular tourist destinations have resulted in driving demand for new and more sophisticated forms of entertainment and vacations such as parties in yachts in the middle of the sea or sailing in luxury yachts. World over, changing lifestyle of people and the increasing number of yacht charter destinations has been providing a major boost to the global market for yacht charter. Additionally, the ease of booking yachts and technologically superior and safer ones are also serving to up demand in the market. As per Transparency Market Research, the global market for yacht charter is slated to register a 7.2% CAGR during the period between 2017 and 2025 to attain a value of US$14.987 bn by 2025 from US$8.123 bn in 2016. Volume-wise, it predicts the market to grow to 7,684 units from 6,054 units in 2016 by clocking a healthy 7.2% CAGR. Depending upon type, the global yacht charter market can be divided into sailing yachts, motor yachts, and catamarans yachts. Those again come in a few varieties such as classic yachts, open yachts, and others. Currently, the sailing yacht leads the overall market with maximum share due to their high uptake among newbie sailors and sea enthusiasts. In terms of growth rate, however, motor yachts are likely to steal the show due to their high occupancy space, ease of use, and availability. On the other hand, open yachts are likely to increase their market share in the coming years. Depending upon the type of consumer, the global yacht charter market has been broadly classified into corporate and retail, among others. Of them, the segment of retail consumer accounted for maximum share in the market in 2016 and in the years ahead too, is predicted to see good growth. With increasing number of high net worth individuals and ultra-high net worth individuals, worldwide, the demand of the retail segment for yacht chartering will likely receive a major boost in the near future. From a geographical standpoint, the global market for yacht charter was dominated by Europe in 2016. The revenue in the region was US$1.957 bn in 2016. In the years ahead too, the region is predicted to retain its leading share in the market by rising at a CAGR of 7.6% from 2017 to 2025. North America trails Europe vis-à-vis market share and both the regions held about half the share in the global market in 2016. In terms of growth rate, on the other hand, Asia Pacific is forecasted to outpace all others by clocking a CAGR of 8.0% on the back of increasing charter destinations, rising disposable income, and improved availability of yachts. Some of the popular yacht chartering destinations in Asia Pacific, include Thailand, Australia, Singapore, and Malaysia. The Middle East and Africa is another key market which is predicted to make impressive strides in the near future by expanding at a CAGR of 7.8%. The market in the region is being mainly powered by Brazil and Dubai. Key companies competing against one another in the global yacht charter market are Yachtico, Inc., Zizooboats GmbH, Boat International Media Ltd., and Charterworld Limited. Yachts are motor-driven or sail-driven vessels that are used for primarily for recreational purposes. Yachts available for chartering can be privately owned or can be owned by the companies that lend yachts for chartering. Generally, yachts are big enough to contain a cabin. They can be multihulled or monohulled vessels. Yacht charter is basically renting a yacht for recreation. Yacht owners usually charter their yachts when these are not being used by them. There is a basic difference between a boat and a yacht, the length and expense of the vessels. However, the primary difference is that a boat is essentially a watercraft used for residential, commercial, or recreational purposes whereas a yacht is only associated with recreation and luxury. 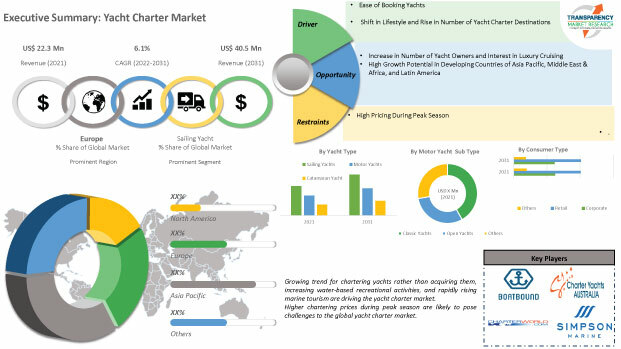 This report on the global yacht charter market highpoints the present scenario of the market coupled with expected growth of the global yacht charter market during the forecast period. Various social, political, technological and economic factors have been analyzed which are likely to impact the demand of yacht charter in the coming years. An exhaustive study of the market dynamics i.e. global market drivers, restraints and opportunities has been included under the purview of the report. The global yacht charter market has been segmented on the basis of yacht type into sailing yachts, motor yachts and catamarans yachts. These types are further divided into classic yachts, open yachts and others. Sailing yacht accounted for a maximum share in the global yacht charter market. However, motor yachts are likely to grow at a significant pace owing to many reasons including high occupancy space, ease of use, and availability. On the other hand, open yachts are likely to increase their market share in the coming years. Travelling has become one of the key trends in the recent times. Consumers looking for holidaying nowadays choose their destinations very wisely. As the number of destinations for yacht chartering is increasing at a steady pace, so is the demand for yacht chartering. As consumer preference towards yacht chartering is rising, there is an increasing popularity of charter destinations especially among the young population. Moreover, the growing inclination of corporate consumers for yacht chartering is also on the rise. As businesses and corporate houses look for destinations that are serene and peaceful, yet happening, therefore, they prefer yacht chartering for spending their vacations. Additionally, owing to a shift in lifestyle, sailing destinations have also been observed to break off from the traditional Caribbean and Mediterranean waters to less familiar destinations of Asia Pacific, Middle East and Antarctic. Thus, growing inclination of consumers to explore new destinations and rising number of destinations globally is likely to consequently increase the number of yachts available for charter, thereby boosting the overall yacht charter market. Additionally, the key players that are operating the yacht charter market have been thoroughly profiled and the competitive landscape is comprehensive of these companies’ recent developments associated to yacht charters and the divergent business strategies followed by them. To analyze their market positioning further, SWOT analysis for each of the players has been provided. Furthermore, the report includes market attractiveness analysis of the segmentation, by yacht size, for offering a deep insight into the major yacht size that is governing the global yacht charter market. Some of the major players operating in the global yacht charter market include Yachtico, Inc. (U.S.), Zizooboats GmbH (Germany), Boat International Media Ltd.(U.K.) and Charterworld Limited (U.K.). Other players operating in the global market are Burgess (U.K.), Incrediblue Limited (U.K.), Boatbound Inc. (U.S.), Martello Yachting and Company (China), Northrop & Johnson (U.S.), Fairline Yachts Ltd. (U.K.), SuperYacht Logistics (Japan), Fraser Yachts (U.S.) and West Coast Marine Yacht Services Pvt. Ltd. (India) among others.